Cranium Cadoo is the all-new, outrageously fun game designed especially for kids. With a variety of hilarious activities, Cranium Cadoo gets kids thinking, creating, giggling, and grinning as they try to get four in a row to win. Can you sculpt a taco? Act out a hula dancer? Can you think of a word that describes both to bounce a basketball and drip milk from your chin? Which is stronger for its size: an ant, human or chimp? Whether you love to act, puzzle, sketch, sculpt, or even crack secret codes, Cranium Cadoo has something for you. 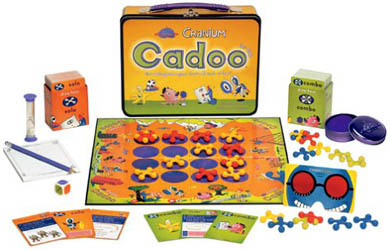 Two or more kids will have a blast playing Cranium Cadoo-even grown-ups will love to play and show what they Cadoo. For 2 or more players, ages 7 and up. This version of Cadoo comes in a tin lunch box style carrying case.